Today we have a chance to have a chat with Marco, the person behind COLLIDER ART, online psychedelic art shop and mobile art gallery. Marco in his team is participating directly in the spread of psyart around the world, proposing high quality prints on cotton canvas. 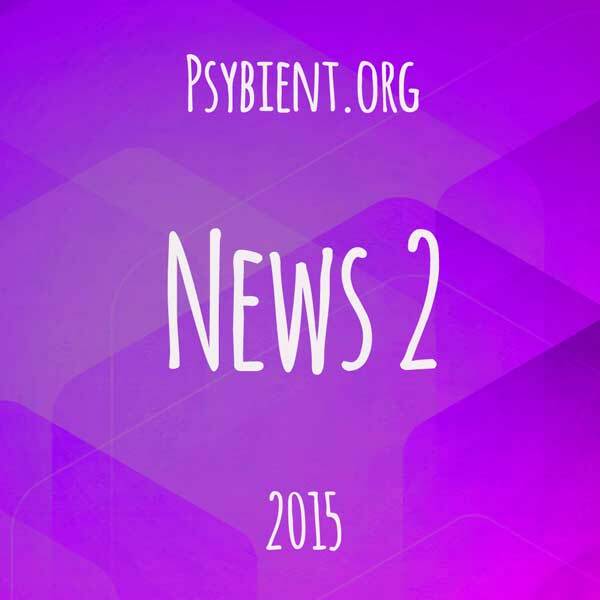 In this interview we speak about gallery project, psychedelic art and psy festivals. Hi, Marco! First of all thank you for the art input in the psychedelic festival scene. I am a fan of your project since 2 years, and finally I got my first piece from your catalog recently. Please tell us what was your first encounter with psy art? Thanks for your support and appreciation, if our project is alive is thanks to people like you who support the project and the artist I promote. 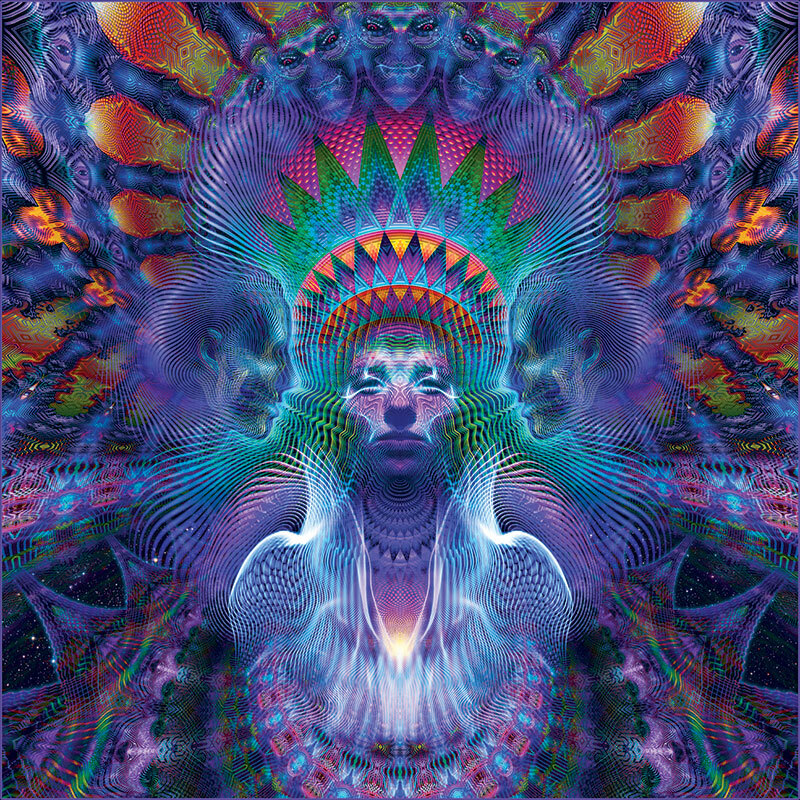 The first time I bump on psychedelic art was about 8-9 years ago, when the Looney Moon rec guys invited Luke Brown in Italy for the first time for an italian tour. How did you decide to start colliderart.net and how was the beginning? The collider art gallery is not only art project but also a business project. Did you invent this business model of printing art pieces or it already existed before in other genre of paint art? In 2011 the project was born under the name of Looney Moon Vision, a branch of the well established Looney Moon rec, and few years later I decided to change the name to Collider Art to be more independent. 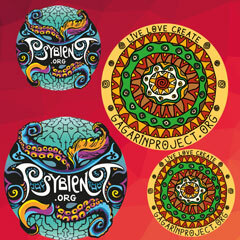 The project is aim to spread contemporary psychedelic art, to do so we self-financing our project through the sell of art reproductions, of course this is a way to support the artists too since the incomings are shared with all the artists we promote. The ‘print and sell’ model is well old model. Did you ever change this business model since the beginning or it stayed the same ? Well I would not say change, I would say we improved it thanks to the experience on the field. Is there any difference between psychedelic art and visionary art? Yes there are plenty of differences, it’s a quite long story to describe it well, I prefer not to be hasty on this answer, anyone who is interested to know better this topic is invited to write or have a chat with me at one of our next events. Your project catalog is around 100 art pieces. What is the process of adding new art? Are you opened for submission or you prefer to find new artist yourself? How often do you update catalog? It’s a steadily expanding collection, I ask to artists who I like to join the collective and the other way round. Usually I do a massive update to the catalog after the festival season tour. I’m currently working on it so if you are interested please follow the FB page or register to the newsletter of the website. What was the most challenging difficult part of your project so far? I’ve got a huge list! 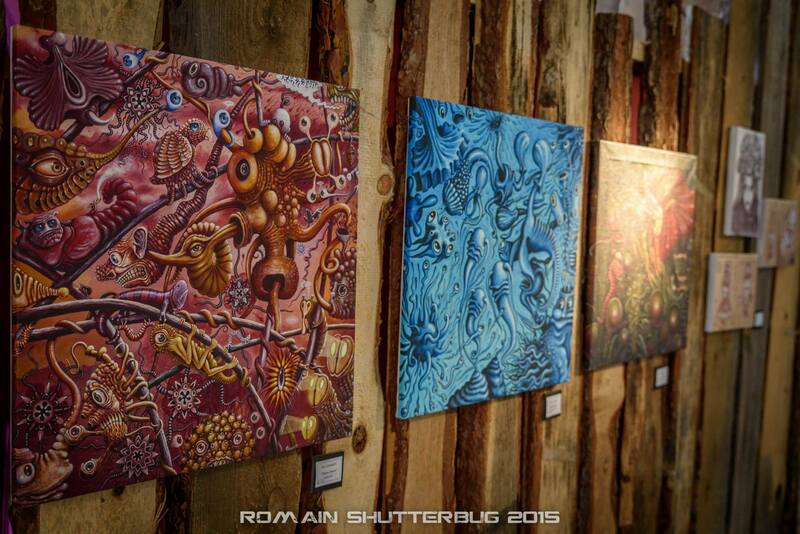 One of the main challenges is to improve every year and offer to festivals/attendants a more professional and always better looking art gallery, my aim is to offer the most immersive experience in psychedelic art, I’m constantly working on it. Can you imagine that one day Ikea can buy rights from a visionary artist and sell it all over the Ikea shops? Do you think it will have success? In general do you think this art is for everybody? I see this scene growing year after year, as all the art movement it started very underground and slowly but surely is going overground. 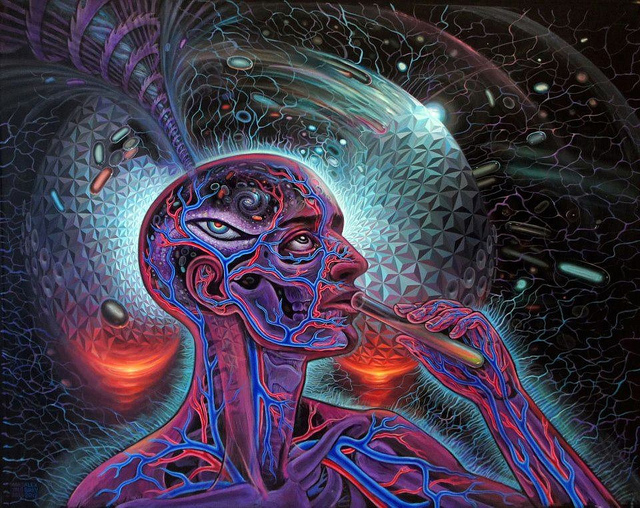 I don’t think it’s for everyone, I think this art it can be better appreciated from people with a more aware/consciousness level of the average. If Ikea will ever buy the rights from a visionary artists, it means that we are already mainstream and it will work for sure, btw I think it will never happen. What are the top 3 countries in your sales? Do you have any explanations why these countries and not others? By now I would say Switzerland, France, the Netherlands and Germany, I believe those countries buy more than others ‘cause I’m very active in those countries and they are not in a financial crisis. Do you have exclusivity agreement with authors? No I do not, it’s opposite of the idea of spreading this art and the messages in it. What are personal preferences about music? I do not have a preferred musical genre, it depends on the mood. In general I like good quality music and for sure it must be out of the box. When was your first encounter with festivals ? 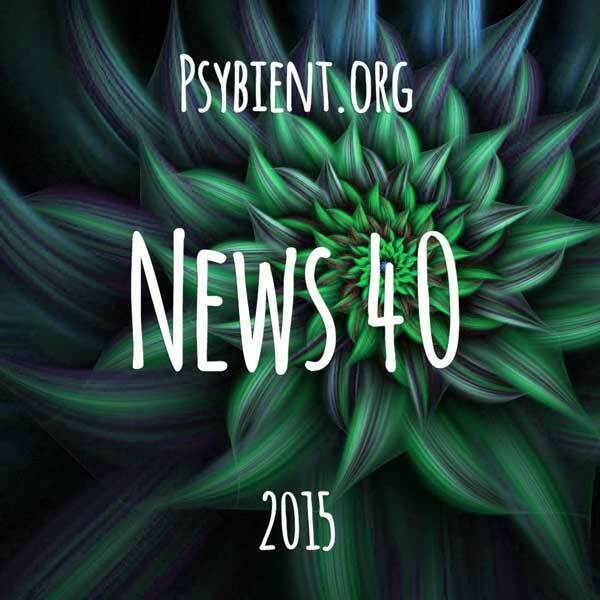 What do you think about Psy festivals in Europe? Sonica ‘06 and straight after Boom ‘06. I think it’s a fast growing scene and for sure we have some of the best Psy festival in the all world, it’s gonna be fun to see how the scene will evolve in the next 5-10 years and I’m happy to contribute and be part of it. What was the weirdest situation you have ever had at the festival about the gallery? Well I’ve had so many weird experience as you can imagine, but what comes to my mind right now it’s about a girl masturbating right next to the art shop counter, it was not a nice moment as many might think, she was totally out of herself, few minutes before she tried to steal ‘Tina’ (my girlfriend’s dog), crying and screaming all over the art gallery, what a freak!!! 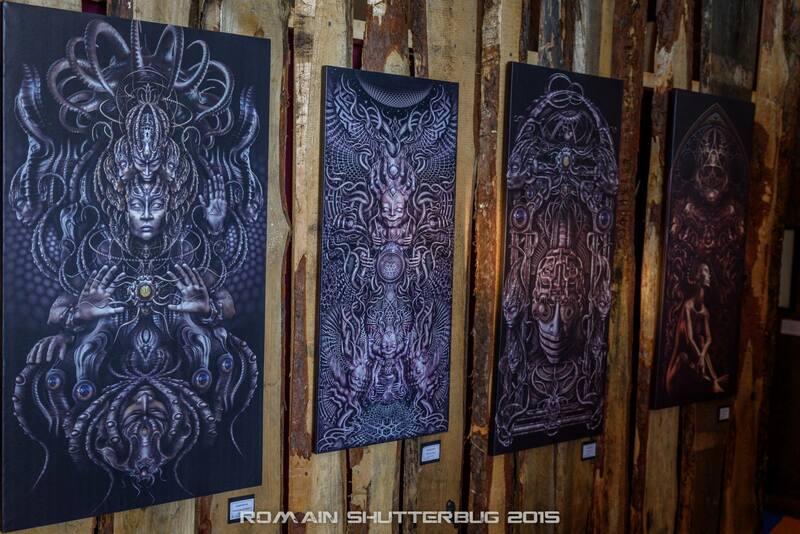 Have you ever exposed the gallery in an event which is totally out of psychedelic culture? How did it go? Right now I’m in Rome for the opening of our next exhibition called Inner Visions at Spazio Interiore (www.spazioninteriore.com) that will last for three months (31/11/15 – 28/01/16). It’s a publishing house and cultural center focused on spreading knowledge and research of human nature. Actually they are not totally out of the psychedelic world cause they publish books about therapeutic use of psychoactive substances like the italian release of ‘DMT the spirit molecule’. It’s a promising and exciting collaboration! Imagine you have a chance to supplement festival galleries with some masterpieces made by famous artists like Bosch, Dali. What would be your choice? Difficult to pick a masterpiece from those two guys, they did so many good art works. 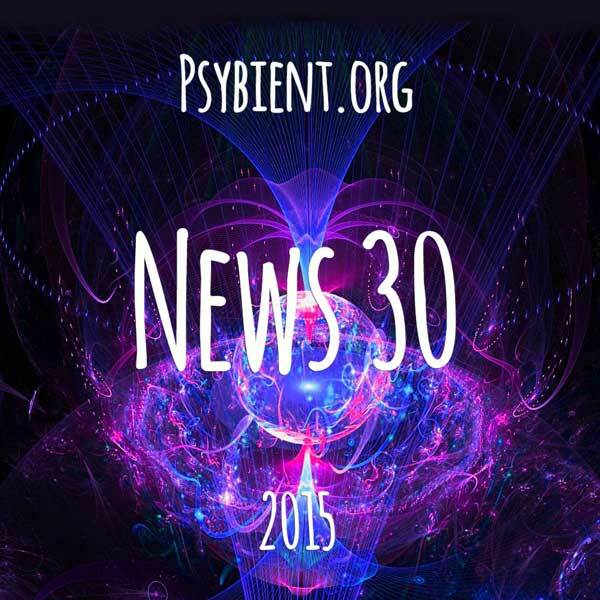 Now we are in 2015, As a regular festival attendee, what do you think about evolution of psy festivals? (good or bad directions are observed). Do you see the actual process like evolution or recession? I see a constantly growing scene and as everything in this life it has both good and bad sides in it. It’s good ‘cause more people can get to know this ‘lifestyle’ and pick some of the good ideas, many festival nowadays shows people that a different/alternative/sustainable lifestyle is possible rather than the one offered by the ‘system’. The bad side is that many people goes too deep in it, forgetting about the ‘real life’ and goes to festival just to show up their latest fashionable hippy cloth and gadgets, gulp down countless different type of drugs (most cases very bad quality), and thinks that the psy movement is all about that. What are your 2015 festival highlights? Psy-fi (www.psy-fi.nl) has been a nice experience, I like how the festival is growing and I feel the attendees are more chilled and friendly than other festivals. What is your favourite festival and why? Freq’s of nature (www.freqsofnature.de) is one of my fav festival at the moment. I’m managing the art gallery since the first edition, I really like to work there, you know…germans are reliable and well organized :) during the building up everything goes smooth and there is real team work, moreover I like the concept behind it and how it’s evolving, my only wish is that one day they will move to a more natural location, but so far no complains. What are other project that you are involved in? Since one year I’m working with my great friends of Ihti Anderson decor team (www.ihtianderson.net), I help them to set up their blowing mind decor around the world. Where would you like to see your project in 5 years? In 10? My wish is to spread Collider Art out of the festival and parties scene, I believe out there are lots of people who can get benefits and appreciate this art movement. — Thank you for your time ….. if you wish to transmit a message to our readers please do it! Thank you for giving me this space. The message I want to transmit is about Collider Art project: “A picture is worth a thousand words”.